Renogy 100 Watt 12 Volt Monocrystalline Foldable Solar Suitcase w/ Voyager. The Renogy 100W Monocrystalline Foldable Solar Suticase it the top choice for portable power solutions. This unique solar suitcase is an entire solar power system incorporated into a single, compact package. Light weight in design this 25 lb panel makes chargeing on the go easy. Heavy duty handle and latches for longevity. Compatible with gel, sealed, lithium, and flooded batteries. Charge controller with LCD display for displaying operating information and data. 20A built-in 5-stage solar charge controller provides overcharge protection, reducing fire risk. Negative-ground charge controller for compatibility with an RV, boat, trailer, etc. The low-voltage system avoids electrical shock hazards. Renogy 100W Foldable Solar Suitcase. Maximum Operating Voltage (Vmp): 18.0V. Maximum Operating Current (Imp): 5.56A. Open-Circuit Voltage (Voc): 21.6V. Short-Circuit Current (Isc): 6.0A. Operating Temperature: -40°F to +185°F. Folded Dimension: 19.9 x 27.2 x 2.8 inches. 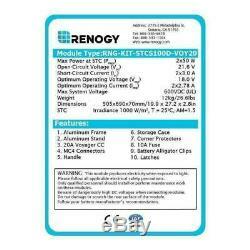 Renogy 20A Voyager Charge Controller. PV Input Voltage: 26 VDC. Storage Temperature: -40°F to 185 °F. Operating Temperature: -40°F to 140°F. Terminals: Up to 10 AWG. 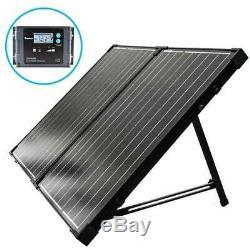 (1) Renogy 100 Watt Monocrystalline Foldable Solar Suitcase. 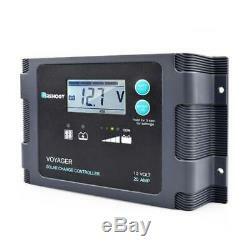 (1) 20A Voyager Charge Controller. (1) MC4 to Alligator Clips w/ Fuse. The item "Renogy 100 Watt 12 Volt Monocrystalline Foldable Solar Suitcase with Voyager" is in sale since Monday, February 4, 2019. This item is in the category "Home & Garden\Home Improvement\Electrical & Solar\Alternative & Solar Energy\Solar Panels". The seller is "survivalgearsystems" and is located in Post Falls, Idaho.